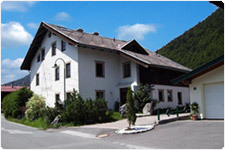 Welcome to Haus Birnhof, Apartment Tirol! Apartment Tirol is located (640m height) in the beautiful and cozy village Kirchdorf in Tirol, one of the most beautiful areas of Austria, in the immediate vicinity of the Kitzbühel Alps. During the year, you can develop all kinds of activities and recover from daily life. In summer you can enjoy the stunning unspoiled nature by foot or bicycle. In winter Kirchdorf transformed into a winter sports destination for the whole family. Click here for more information.